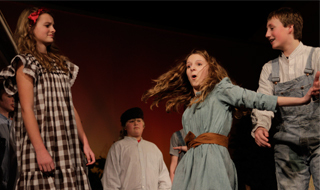 Set in a serene Mountain range in the American West, Sarah Helland's Sweet Angela's Mountain transports the audience to the rough year of 1918. Angela Winters, a weary traveler arriving in the mountain community, challenges herself and others as she works to assimilate into the Mountainside Refuge. 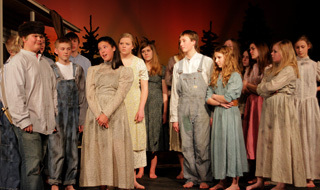 Starring the Hillcrest Jr. High with 8th grader Laura Tungseth as Angela Winters, the cast introduces The Mountainside Refuge as a struggling orphanage. Drawing on a significant upbringing, Angela encounters challenges and life-shaping relationships as she works to apply her Biblical framework to the concrete struggles she encounters at the refuge. Angela Winters is found walking into the refuge as the sole care-taker and primary physician. A position she didn't orginally sign-up for, Angela grows through the challenges and develops a reliance on God that she only knew in concept before arriving at the refuge. The audience is kept informed of the challenges Angela is facing through letters written back and forth to her family members. Often witholding compromising details, Angela gives the audience an inside look into her heart and the challenges she is facing spiritually and physcially. 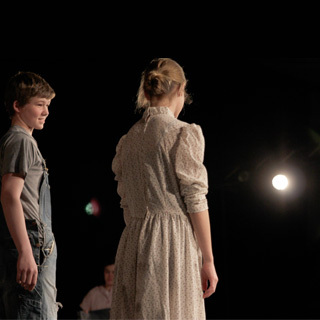 Join the Jr. High on this walk-through the wild west as they use the power of storytelling and acting to communicate the live-changing message of the Gospel of Jesus Christ to the audience. Show times are March 31st and April 1st in the Hillcrest Main Building Gymnasium at 7pm.